There’s nothing better than discovering a strategy that is not only effective but fun at the same time. I increased my domain and hosting orders by 30% and email subscription rate by 50% in the last month. It cost me some money, but it was the best 200 bucks I’ve spent in a long time. If you are a member of my forum, you probably already know where I’m going with this. After eyeing the site for months, I signed up with a free trial of Powtoon (affiliate link), which is a video presentation creation tool. I used it to create short videos with tips and promos for my hosting site, Website Palace. Well, it only took me a day before I signed up for their Agency (yearly) plan so I could gain access to all their features. What’s so cool about this video strategy is it can apply to almost any kind of site and the results can be immediate. So let’s get started! There are many ways to utilize presentation videos, and I will show you the different strategies I’ve been using. This is where you offer quick tips that add to or support the content on the page. On my domain registration page, I created this short, “tips” video that offers advice to up and coming site owners. Almost everyone can utilize this strategy in some way. Take an article and pull out the key points and turn them into a short slideshow or video. Add a call-to-action at the end and voila! Sometimes video helps make complex steps easier to understand. And I’ll be the first to admit that the $1.99 domain promo special isn’t the most intuitive process for my visitors. So I created a quick video that shows them EXACTLY how to take advantage of the offer. Not everyone wants to follow your content in the same way. Some prefer to sign up for email, others prefer RSS, social media etc. That’s why I offer options. Below the video I link to my subscribe page. By the way, this is a page you may want to have on your site as well. I don’t believe in only offering one way to subscribe and then hope everyone conforms to what you like best. For example, let’s say I prefer to use Google Plus to share content, but a lot of my followers still prefer email. If I only had a Google Plus option, I would lose a lot of people who simply do not want to sign up for Google Plus. Obviously the options need to be relevant and convert, but I do believe in providing options. This video was actually inspired by a discussion I had with Ana Hoffman on Google Plus recently. We were talking about whether or not to offer multiple subscription options, and it gave me the idea to create a video that promotes my subscribe page. Anyway, using Powtoon for this kind of video can be very effective because it’s a fun way to remind people how they can follow your content. There’s a reason Powtoon has a template for this kind of video. It’s very common for tutorial sites. For those who are in a hurry and just want a quick overview of the steps to get started, a step-by-step video comes in handy. I’m really looking forward to testing out other ways to use these kinds of videos. I recorded the voice overs in Audacity, which is free and works with Windows and Mac computers. It has an amazingly good noise removal feature and completely eliminated all background hiss with ease. However, when I upgraded my microphone (see below) I was able to remove that step altogether. For years I used a Plantronics headset microphone. It was OK, but I was never completely happy with the quality. 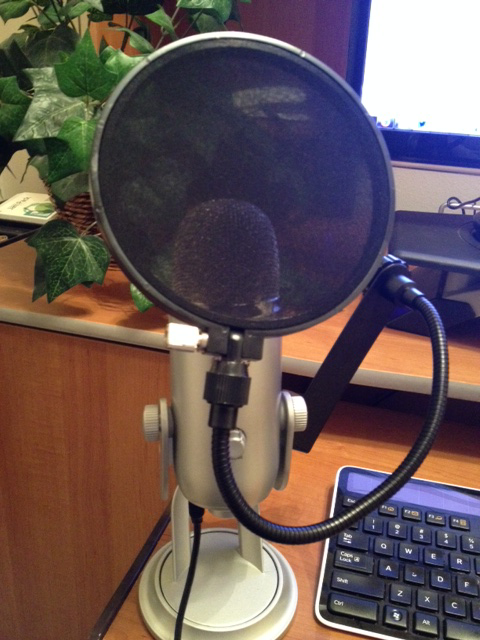 Well, last week I upgraded my hardware and now use a Blue Yeti USB microphone (with a pop filter) for my voice over and screen recordings. The audio is much clearer, but I’ve still got to learn more about the settings because I’m not 100% happy with the final production. I think I may have been sitting too close, and that’s not necessary when a device is that powerful. I later discovered I can actually sit back in my chair to record while the microphone is a foot in front of me. Powtoon has a handful of graphics you can use, but for image edits and simple icons I used Photoshop. Of course you know there’s no need to spend that kind of money on a graphic editing program today with sites like Fotor, Canva, Pixlr, PicMonkey and more. I use Photoshop simply because I learned the program on my previous 9 to 5 job and I love that I have ultimate control over creation and edits. I was a long-time subscriber of Photos.com, but they are closing down today so I switched to ThinkStock a few weeks ago. No doubt there are cheaper options out there and I wouldn’t recommend this if you are on a budget. However, I love how easy it is to find high-res images at various sizes, and I have the rights to use them commercially. Be careful with many of these free or low-cost stock image sites. Make sure you read the fine print. You may think you have rights to use them on your site, but many of them do not give rights for commercial use. Or if you can use them on commercial projects, you have to cite the source in a certain way. I don’t want to scare you, but people get sued over images all the time. (Read this story!) Just be careful. Citing the source of an image you find on the Net doesn’t necessarily clear you from legal problems. I know that MorgueFile allows you to use their images for free on commercial sites without citing, but their selection is limited and quality is so-so. It’s not a coincidence you are seeing more of these short, animated videos on landing pages and on other types of content. We live in a world where people’s attention spans are getting shorter and shorter. So a quick video that gets the point across in 60 seconds with a clear call-to-action can be very effective. Not to mention a lot of people are visual learners. So a well-produced “explainer” video that illustrates a problem and points to a solution is another way people are using these kinds of videos to boost conversions. You can see some great examples of explainer videos here. I plan to create some of these myself. 1) Add a call-to-action at the end. 2) Keep it short and to-the-point. I try to keep mine between 45 and 90 seconds. 3) Background music can be effective, but keep it very low. Many times people crank the music up so loud it distracts from the speaking. The other mistake is people people play inappropriate music for the type of video. Simple melodies usually work best for videos with a voice over. Powtoon offers background music with their service and the premium plans have the largest selection. You can also download royalty-free music from Incompetech. 4) Keep the presentation moving so your audience stays engaged. 5) If you’re promoting affiliate links in the video, setup a 301 redirect with your web host and use yourdomain.com/linkname instead of a long affiliate link. Or if it’s a link you use a lot, register a domain name for it and forward the domain to the link. Most domain registrars have free domain forwarding. So I hope this post gave you a dose of inspiration and you’re already thinking of ways you can use these kinds of videos on your site. If you’re on a budget, try Powtoon’s free service. The downsides are you have to use their watermark in all your videos and the features (music, images etc.) are limited. Nevertheless, you should still give them a try. If you decide to upgrade, enter the promo code POW1 to get 20% off your purchase. These are really cool short videos, and you make them look so easy. Are they really as easy as they look to put together? information with us and keeping us on the cutting edge of what’s going on!! How to setup a 301? Do you have video tutorial to do that? Thx..
It’s very easy. Just login to your hosting account and go to the homepage/control panel of your account. Look for something that says redirects or 301 redirects. All you do is give the URL a name. yoursite.com/folder and then tell the script what link it should redirect to. No doubt there are also youtube videos on how to do this too. Good luck! Great videos Lisa. Very well done and informative. Now I only wish I had done what you suggest in them. I messed up on a few accounts like not getting the traditional spelling for my domain PizzaSpotz and not buying the .net and .org. Live, learn and lose traffic, right? Really enjoyed reading this post Lisa. I’m adding rss feeds and am experienced with them so i’m making a list of rss services and ran across your post. I use Powtoon and love it and must say you’ve done a great job with your videos. They are as polished as most fortune 500 videos and better than some of these tutorial videos i’ve been seeing out here. Keep up the great work. Wow, thanks for the compliment, Martin! OMG Lisa! I have been looking for a poster maker and you mentioned it in one of your videos! CANVA! Lifesaver!!! Woo hoo! I cannot believe how easy it is to use. Also use fotor and looking forward to trying out your other recommendations. Thank you so much for your dedication to your site and your subscribers! Your Awesome Lisa! So happy you found Canva useful. Yes it is amazing and a game-changer! Thank you for coming by. I like this post very much because I was gonna buy Optin Monster plugin to increase my email Subscriber but this post gave me a new alternative. Thank You So much !! Once again a useful guide for affiliate marketers, this one is really awesome. Thanks lisa for sharing it. Great blog post! You are a wealth of knowledge. You always create informative and helpful information. A lot of people are afraid of video, but using Powtoon is a very creative way of producing many types of video. They could also be used for affiliate marketers. I used Go Animate in the past. It took me hours to create a video that was only 1 minute long. LOL After that, I gave up. But they way you’ve used these videos are much easier and simpler. Thanks! Took me about 30 minutes to figure out how to use Powtoon then once I learned it, I literally did each video in about 15-20 minutes. Btw – the folks over at LeadPages started a new podcast called ConversionCast. They’re looking for awesome case studies like this to feature on the show. I bet they would love to hear from you over there. Thanks for the inspiration Lisa! Sweet, thanks Ileane! You are always in-the-know! I just don’t know how you keep up with it all. this is one of your best and most informative posts I have read. Very good, tons of excellent information. Thanks Lisa. Thanks Stephen. You are too kind. great article Lisa. You have always been an inspiration for affiliate marketers. Thank you for the share. Looks like a great tool, Lisa – just played with it for a few minutes and can definitely see the potential. One call to action or many? I suppose one size will never fit all. 🙂 Thanks for the shout and for bringing me to the post! Lisa I’ve read some of your articles as a friend suggested them to me and now I”ve read this one.Powtoon never heard of it and I think I would have never know about it I didn’t follow your articles.You always come with something out of the box that your readers never thinks of.Thank you for you contribution with the interactive videos to make our lives easy than before. I have been following Lisa for quite sometime and she always sharing some good information with her readers. 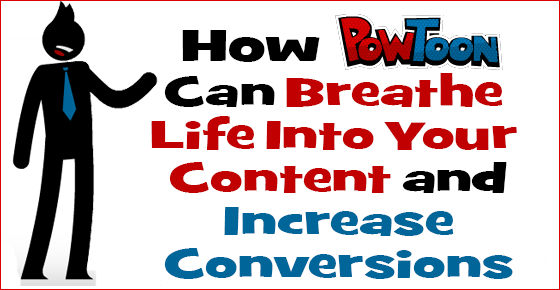 Powtoon is a great website and they can increase your revenue tremendously. Great post Lisa! Thanks for sharing this information. I’ve already bookmarked the website, PowToon to see if I can use them for creating online tutorials. I think it just may be what I have been searching for. Cool, let me know how it goes Stephanie! Wow wow wow I REALLY like this program! It’s really professional (and fun) and I think it’ll help with very basic info-type videos. Go for it Jay! And yes, I like the fact that it’s professional yet fun at the same time. I feel they sort of lighten the mood of a website and add personality at the same time. What a fantastic blog post! Let me introduce myself. My name is Jordana and I am the Community/Social Media manager at PowToon and I would love to talk to you about maybe guest blogging for us and using your story in one of our case studies that we hope to publish on some big name high-tech blogs! If you are interested please contact me at jordana@powtoon.com and we can go from there! We really loved this post and are so happy that you are enjoying your experience with PowToon! Thanks for getting in touch, Jordana. Will drop you a message!